Anybody that has miraculously managed to finish reading one of my articles might have noticed a peculiar biography at the bottom. Other than myself being a peculiar creature, my tragic attempt at humor stems from one of my favorite games of all time; Grim Fandango. Point and click games have never been particularly popular, often creating frustrating puzzles with answers that are hard to come by. I recently completed Goetia, a fantastic point and click game that I would recommend to any experienced puzzle solver, but for those new to puzzle games, it might demoralize before it terrifies. 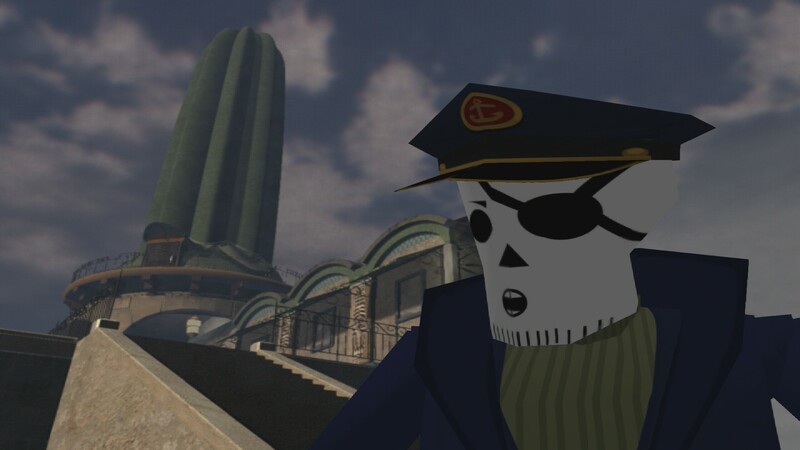 Grim Fandango has always been the Number Nine ticket that bridges the difficulty gap, providing enough of a challenge without discouraging the player. The ability to progress without too many hours spent walking around in circles, much like Chepito and his little light on the ocean floor, allows the story to flourish. Much of the motivation to complete point and click games is to find out how the story unfolds. Tell a tale that keeps me wanting more, then you’ll keep me clicking around the screen looking to pick up random objects. Grim Fandango’s position between life and heaven is as humorous as it is sentimental, and it’s this balance that allows the story to unfold in numerous ways. This blend of Aztec folklore and film noir cinematics doesn’t initially seem like a harmonious palette, but much like bacon and chocolate, it has to be tasted to be believed. 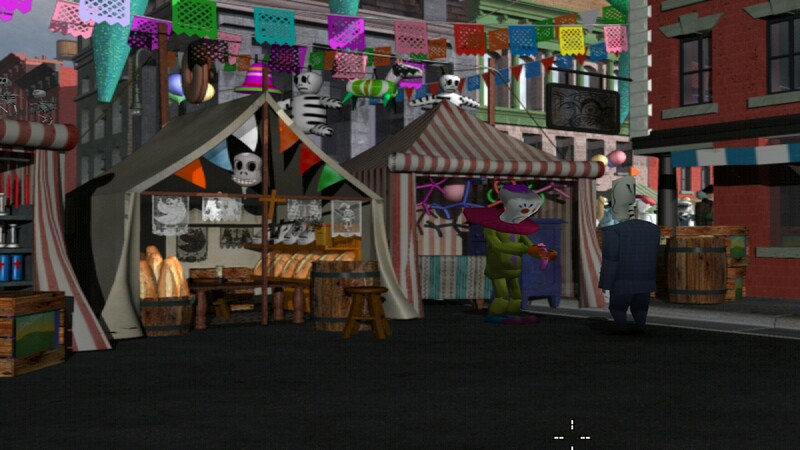 Grim Fandango’s ‘soul’ purpose is to poke fun at death. It’s almost ironic how the characters are based off Mexican calaca figures as this is anything but a celebration of the dead, more a fixation on the corruption of living. Following the afterlife of Manny and his position as a travel agent at the Department of Death in the city of El Marrow, it becomes apparent not much changes between life and death, working until the “powers that be” feel the debt is sufficiently paid. Essentially, his job is to taxi souls from the living to the dead and then sell them their journey to the Ninth Underworld; his mundane job is made to look glamorous by his scythe and robe, an amusing adaptation of the Grim Reaper. It’s a correlation of familiar themes and Aztec folklore, with a dark plot reminiscent of the film noir genre. The storyline of Grim Fandango draws inspiration from a number of films from the 30s and 40s, notably Double Indemnity which outlined the framework for much of the narrative in the game. The second act itself resembles the film Casablanca, with the main villain Hector LeMans modeled on Signor Ferrari. This blend of Aztec folklore and film noir cinematics doesn’t initially seem like a harmonious palette, but much like bacon and chocolate, it has to be tasted to be believed. The morbid humor perhaps says more about me than the game itself. While the story soon sprouts into a murder mystery, the result of ‘death’ in the Eighth Underworld means being reborn back in the land of the living; a truly terrible fate. It’s amusing, and even when dealing with serious themes, there’s a light-hearted punch that keeps the celebration going. Grim Fandango was a divergent choice, a contumacious decision against my established preferences. Tim Schafer has form with developing clever point and click games, The Secret of Monkey Island is a classic and is perhaps his most well-known game. Broken Age is also a Tim Schafer point and click game that had a fascinating narrative that kept the player hooked beyond some of its disturbing endeavors. However, Grim Fandango remains the game that balances the humor of The Secret of Monkey Island with the disturbing themes of Broken Age, a complete blend of what makes a Tim Schafer game enjoyable. The question remains how Grim Fandango changed my life. At the moment of its release in 1998, I was well and truly already a gaming fanatic. However, the diversity of my gaming experience was limited. I would typically play RPGs like Pokémon and Zelda, with a dashing of FIFA; growing up in England ensures FIFA is completely unavoidable, and FIFA 98 is a classic. It doesn’t need to be said that Grim Fandango was a divergent choice, a contumacious decision against my established preferences. But with the charismatic nature of Manny and the cheerful disposition of Glottis, I was convinced to open my mind to point and click games. The rest is history. Grim Fandango remains one of my favorite games of all time, and certainly one of the most influential on my gaming experience since. If I hadn’t taken the chance and played Grim Fandango, my gaming experience would probably have remained bleak, and with that in mind, I probably wouldn’t be writing about video games and working for Goomba Stomp; whether the alternate version of history is preferable, I’ll leave that to the reader. Ultimately, ignoring its impact on my career choices, Grim Fandango is a masterpiece. Whether to begin a foray into point and click games or to immerse into a captivating story, Grim Fandango offers a unique experience that has yet to be rivaled. Back in the late 80’s and early 90’s adventure games were very big. They were a huge deal, especially Sierra On-Line and Lucasfilm Games (later LucasArts) had a big following, almost like foodball teams. You often preferred one over the other. So I guess you should look into their games first. Lucasfilm’s are a holding up a bit better today because they never punished you for making a mistake, something Sierra’s games often did. I would point at Indiana Jones and the Fate of Atlantis and Full Throttle for some good times. Also, it was really Ron Gilbert that made The Secret of Monkey Island, not Tim (though he played a minor role, but is never though of as the creator). Thanks for suggesting some point and click games. It does seem my statement about point and click games never being that popular has created a debate on their position in history. Whether they were huge or not, they’ve never seemed to eclipse other games of the era for longevity and recognition. It seems to have maintained a dedicated fanbase though.